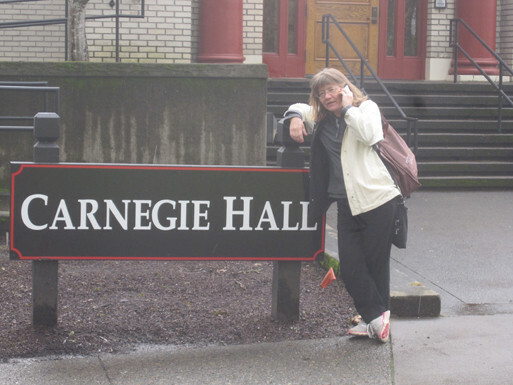 Susan Schultz gets good reception at Carnegie Hall (Pacific University). Not long ago, Susan M. Schultz stood reading poetry before a class of undergraduate psychology majors, who just minutes ago were reviewing episodic memory with their dynamic Memory and the Mind professor, Erica Kleinknect. The students seemed to quickly engage this creative approach to the ideas they were studying. After Schultz read, one young man asked a follow-up question about George Oppen (Schultz had alluded to Oppen earlier). I think he asked about whether traces of Oppen's dementia showed up in his late poetry. A discussion about George Oppen! And in a psychology class! Lovely. As my recent commentary demonstrated, I have been mulling ways readers might be afforded entrance into a text as a way to rethink accessibility. In the example above, everyone was interested in memory. The fact that people approached a shared interest differently (poet, psychology scholar, undergraduate majors) created a palpable energy. When I get questions about DB, they are all over the map. Some are theoretical (having to do with life writing), some are literary (formal questions), many are personal (what would your mother think of the writing?). But some are on the cusp between metaphysical and practical, and cast me as an "expert" (to enter your other point of discussion). These questions are sometimes mind-bending. They often annoy other members of the audience, especially when they seem to draw the focus onto the questioner and his mother or father or loved one. But they strike me as necessary questions, ones that deserve a different forum from the poetry or literary reading, rather a conversation group. It's where literary reading meets support group but the latter can't quite come into being. And yet people are coming to the literature for some measure of support. Perhaps there needs to be a different kind of event, one that combines the literary with the outright pragmatic. Like how do people find care, pay for it, keep themselves afloat in the many senses of that word, talk to parents who can't talk back, grieve for them when they're still alive? Such events would require more than one speaker. The closest I came was with the group I talked to–experts in gerontology and social work–who came with their own stories, their own concerns, and we most ended up talking, not in the position of reading/listening. • Not too long after the book was published, I gave a talk at the Center for Biographical Research at the University of Hawai`i-Manoa; it's run by English professors, but provides an important resource for thinking about issues of memoir and biography. I read from the book and talked through its central concerns. One moment sticks out in my memory. I had used a metaphor rather loosely to describe the effects of Alzheimer's, namely that the disease is like a neutron bomb that destroys what is inside a building, but leaves the shell. After the talk, an elderly woman looked me straight in the eye and told me how awful that metaphor was. They are still human beings, she said to me. Since then, I've tried to change the figurative language I use in talking about Alzheimer's. Like higher physics, perhaps, the illness requires figures to describe it. When you deal with people who cannot talk “straight” or who cannot talk at all, it's hard to be entirely literal-minded oneself. I gave another talk at the Center after Old Women Look Like This was published. Many of the questions afterwards were unacademic, almost self-help questions. How do I deal with my mother? Where do I go for help? Or even, I don't see what's so sad about all this; my mother and I laugh a lot. While the formal issues intrigue poets and writers, more emotional and practical ones emerge at readings and talks. I often feel unqualified to answer, though listening is perhaps what matters most in such situations. • I gave a reading in Boise last Fall. It was very well-attended, mainly by students. There was a middle-aged man in a bright orange Boise shirt who mocked me when I mentioned that the UH football team was coming to Boise the week after. (He proved right, when UHM was crushed by the Boise team.) When the reading ended, and almost everyone had filed away, he came up to say that several members of his family have suffered Alzheimer's. He asked me several questions: do you ever write about the problems in your own mind, or your emotional responses to your mother's decline? When I responded that I try to stay out of the story because that belongs to my mother, he said, oh, you're in there all right! He was responding to the work's content, again, but with incredible perception based on his own experience. • Last November, I was invited to talk to Sigma Phi Omega (National Professional Honor Gerontological Society) by Michael Cheang, an Assistant Professor at UHM, who teaches social work and whose mother suffers Alzheimer's. He travels home to Singapore a couple times a year to help his sisters caregive their mother. Again, I read from the work, talked about it. The responses mostly came in the form of stories. Everyone at the two tables at Fook Yuen restaurant in Honolulu had stories upon stories, because they were all social workers, caregivers, teachers of these arts. One woman told the story of a “hoarder” whose house was full of trash and dead cats. I loved her pragmatic and caring response, as her first act was to help the woman bury her cats with dignity. She spoke of learning tolerance from these encounters. And I left feeling tremendous admiration for these people who face extremity all the time and open themselves up to it rather than walking away. • This February, as you know, Kaia, because you organized it, I attended a Psychology class at Pacific University in Forest Grove, Oregon. Professor Erica Kleinknecht teaches the course in Mind and Memory, a course I myself would love to take. She set up the next unit of their class on episodic memory, then asked me to present work from Dementia Blog, my current blog, and from my Memory Cards project. As is so often the case in college classrooms, most of the students had had experience in dealing with dementia in their grandparents. Erica asked me to read a “lovers' dialogue” from the current blog. You can find it here. I think, I hope, that dialogue showed the students how people suffering an early or mid-stage of Alzheimer's are still capable of desire, love, companionship, and resentment of those who keep them apart. Since I left, the class has done a series of their own memory cards—index cards on which the writer enacts episodic memory—and will probably do a series of “I remember” statements, after Joe Brainard. The exercises may be poetic, but the content moves outward into critical and emotional thinking about memory and forgetting. • Occasionally people will have heard of Dementia Blog and will write to me. I often give the book to them if they are in the midst of the confusions of dealing with a loved one suffering dementia. In several cases, I've received messages back that they've read the book and found comfort in it. The comfort is doubtless not one of resolution, but of finding someone going through the same un-comfortable experiences. So the work is finding its way out into the world—of other disciplines, other realms of feeling—and I find that incredibly gratifying as a writer who wants her work to move through words and into world.